The spinal disk is situated between two adjacent spinal bones in the neck, mid back and lower back. It can best be described as a connective ligament designed for strength and flexibility. Like any ligament, it is subject to strain and sprain with accompanying swelling and inflammation and this can cause pressure on spinal nerves. Sometimes this type of injury is called a “slipped disk”, or “a pinched nerve”, either way, the resultant pain is unmistakable lower back pain or sciatic pain, identified as pain down the leg. A correct description for a “slipped disk” is disk herniation or disk bulge. Disk herniations can be identified using CT or MRI scans. Typically the patient with a disk herniation presents leaning to one side (antalga) and appears locked up with severely restricted movement particularly in the lower back and hip area. They may even complain about leg pain if the disk is a lower back disk, or in the case of a herniation of a neck disk the pain may present as down the arm or pins and needles in the hand or hands. Disk herniations typically take time to present. At first, it can start as reoccurring lower back pain. This may be the first symptoms, and the acute attack can bite with the simplest movement. “The straw that broke the camel’s back”, it is often described as “Doc I’ve had lower back problems on and off for years and then this morning I bent to pick up something on the floor, the pain grabbed me and I couldn’t move”! It can be caused by a lifting strain, or for little or no reason at all. 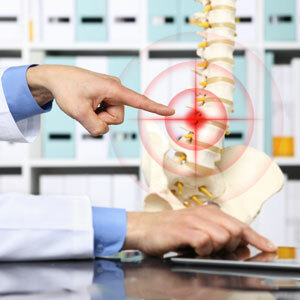 Most disk problems start with a history of chronic reoccurring lower back pain with a sudden onset of Intense stabbing pain, pain or numbness in the limbs, patient leaning to one side and low back is locked up, weak muscles and bowel or bladder issues. If this is you, chances are you have a herniated disk. Often the pelvis is unstable underneath the lumbar spine and the patients will show a short leg on one side. Weak muscles in the abdomen or the hip flexor muscles may contribute. Prolonged sitting over many years can compress the lumbar vertebrae causing degenerative changes to set in and the disk starts to fail. Then comes “the straw that broke the camel’s back!” A slight bend, twist, or sitting on a long car journey may set off the disk herniation and bingo!! The good news is if caught early enough conservative pain-free chiropractic spinal adjustment with soft tissue work can return your disk to its original pain-free state. Some disks will require surgery as they may have passed their limits and are permanently damaged. Our job is to correct the underlying cause and allow your body to heal itself. In 41 years I have sent no more than a handful of patients to a neurosurgeon or orthopaedic surgeon for surgical intervention, however in most cases if treatment is started early enough, we can help, naturally.